After a couple of dismal snow events we finally got something decent. To be fair, it was better than decent. 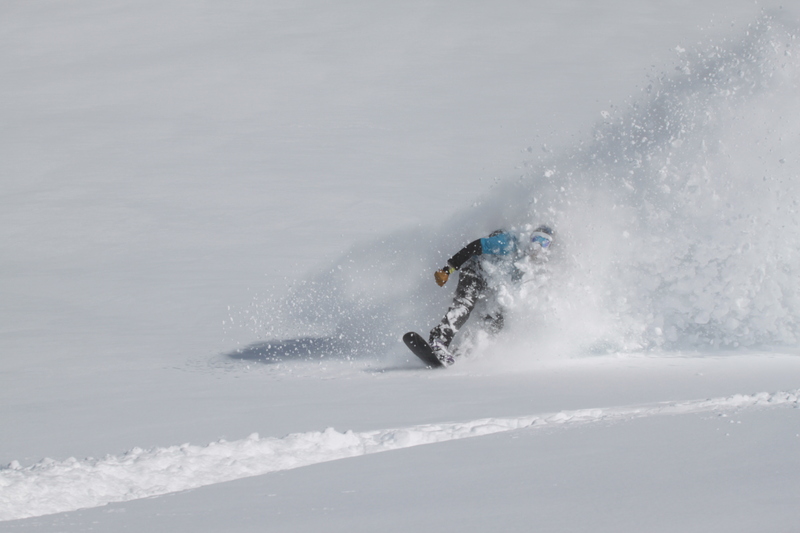 Even though it turned out to be the only solid powder day of the season for me the conditions were unbelievable. Its not very often that we get a decent snow fall, good stability, and little wind down here but this day sure delivered. Visiting Canadian Mike “Pow” Wigley got in touch through the magic of the Interwebz and i went and picked him up with the promise of some excellent conditions. We met Todd and Brad in the lower car park and headed up to the Remarkables ski area. After a quick blast over the top of Curvey basin and on to Jackel col we were sliding down the upper wye creek slopes towards a zone we call The Rifle Range. I had never seen decent snow on the zone i wanted to check out but the Wind direction of the storm suggested possible good snow, the topography wasn’t mellow, but not to steep to worry about slides too much. 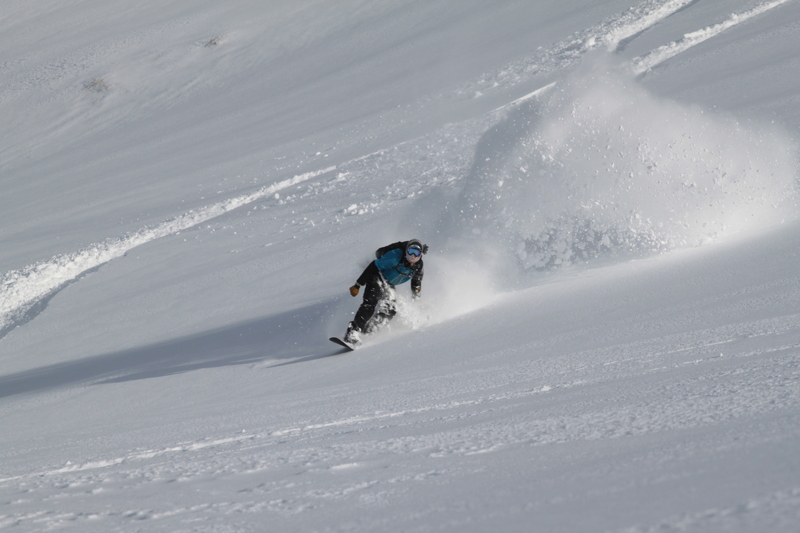 I had heard it was heli skied when the conditions were good which was always a bonus. Skinning over the ridge the snow was deep and low density near the gentle, wide open slopes of wye creek but as we got higher towards the ridge it became windswept and rocky with a thin coating of water ice. I was hoping like hell the other side wouldn’t be bare rock. 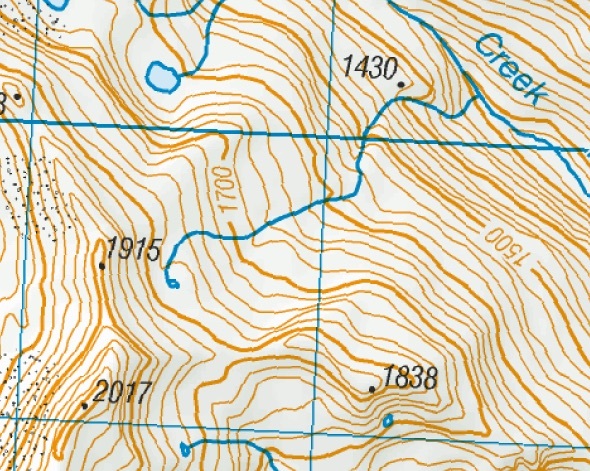 With a wind from the southern half, the upper wye creek area is a massive area for snow to collect and also to be transported with the winds that buffet it. Apart from the 2100m to 2300m peaks around the Lake hope area 8km to the south, there are no peaks south of this area higher than 1500m until you hit Antartica. To say its exposed would be putting it mildly! 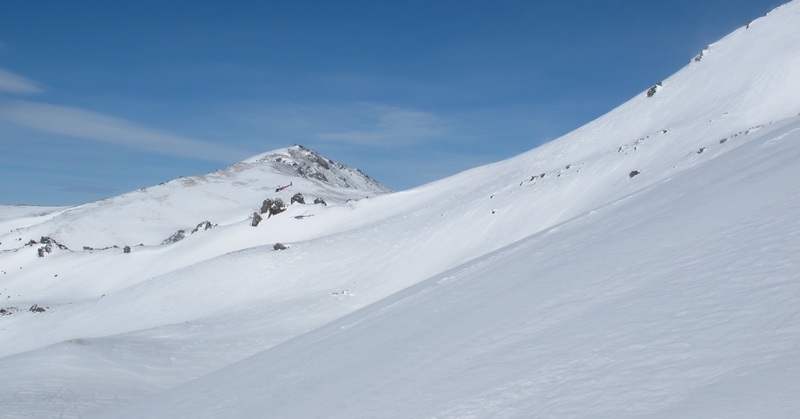 Approaching the Ridgeline with Single Cone (2319m) and Wye Dome (2050m) in back. 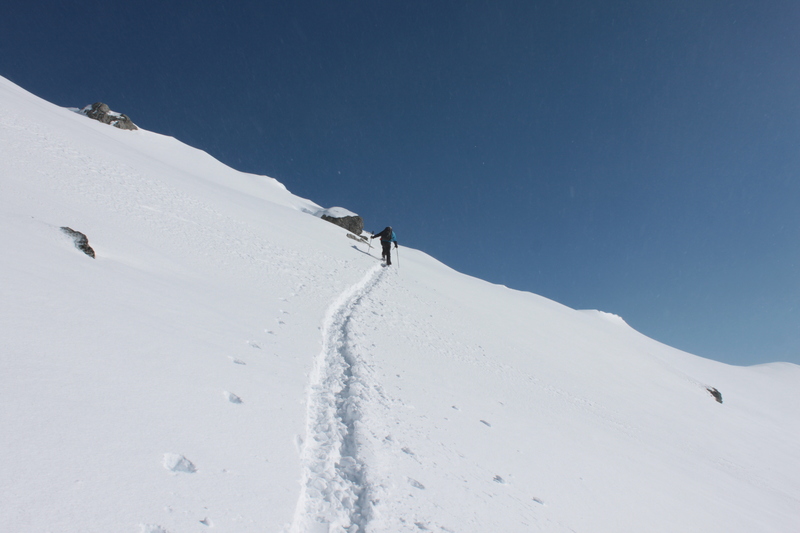 We booted over the last exposed section of the ridge only to be greeted with powder heaven. A large powder filled basin running down to the right branch of Doolan’s Creek 700m below us. 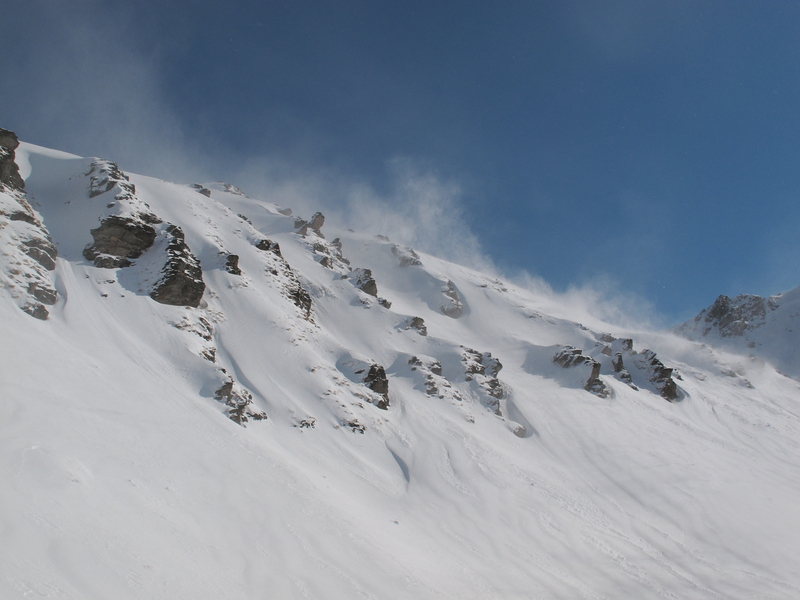 Winds were still blasting us on the exposed ridge lines but it had carried snow over into our zone but thankfully, it didn’t create any large cornices. Ski cuts and jumping wouldn’t get it to move so we picked a spot sheltered from the wind and changed over. The first cautious run was fantastic, with face shots on every turn we all pulled up in the same flat bench at the bottom of the bowl for high fives. We decided to move towards the ski area slightly for a more challenging decent and changed over for another run. As we started off in the skin track the peace and quiet was suddenly broken by the sound of helicopters. They came in over head and i exclaimed to everyone “well i guess this zone does get heli’d!”. Thankfully they landed in the next basin over, on the south eastern aspect of the Rifle Range. 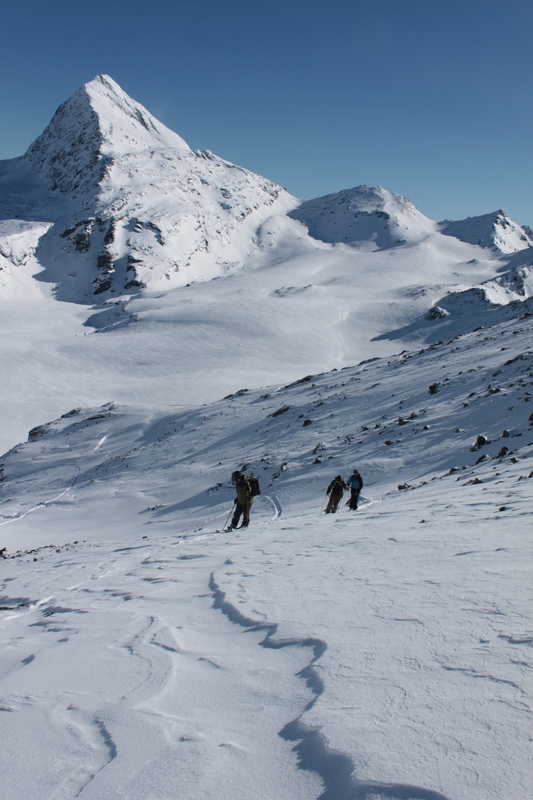 I guess you don’t want people paying top dollar to heli ski to be sharing their pow with a bunch of granola munchers. Round 2 we decided to run to close to the valley floor below which we did in 3 pitches so we could take happy snaps. The snow was some of the best I’ve experienced in NZ, there was much hooting and hollering and high fives and smiles were everywhere. Todd with the Sonic Boom turn. Once we got to the bottom we were on the shores of a Frozen tarn, we looked up to see some awesome looking, if a little thin on coverage chutes and decided to go for it. I love backyard discovery! Upon reaching the plateau at the top of chutes we decided we may as well go for max vertical and go all the way to the Ridgeline for some more white room action. We headed back for the Chutes with the wind gaining intensity and a sundog high in the sky. Sadly the Chutes had manked up and were refreezing. I went first and picked the wrong chute and my slough took a decent chunk of the base on a roll over exposing the tussock below. With average snow on the upper part of the rollover i decided to take the cautious approach and toe edged my way down, hitting ice at the bottom. After radioing the rest of the group and telling them to take the chute riders left i watched them all descend from the other side of the tarn we had been at earlier. 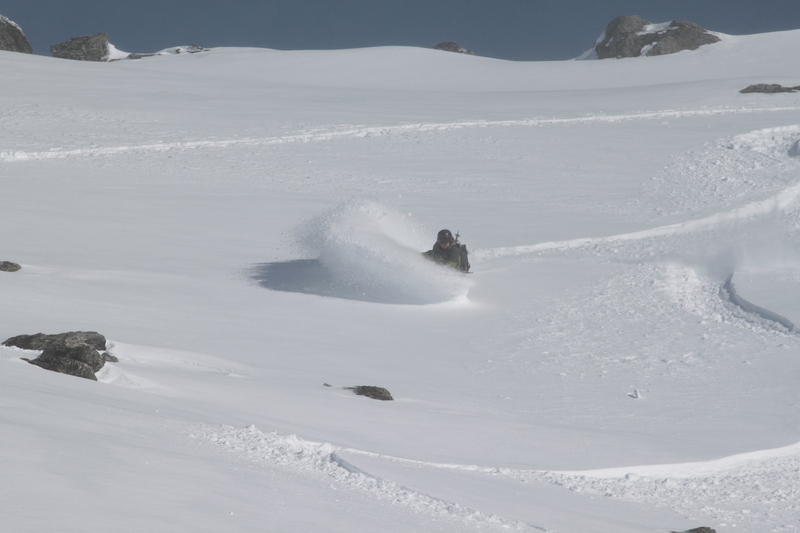 A small slab broke away as Pow dropped in for a few nice turns before hitting the icy lower slopes. The rest of the group made their way down with Todd managing to soak a foot in a melted corner of the Tarn. 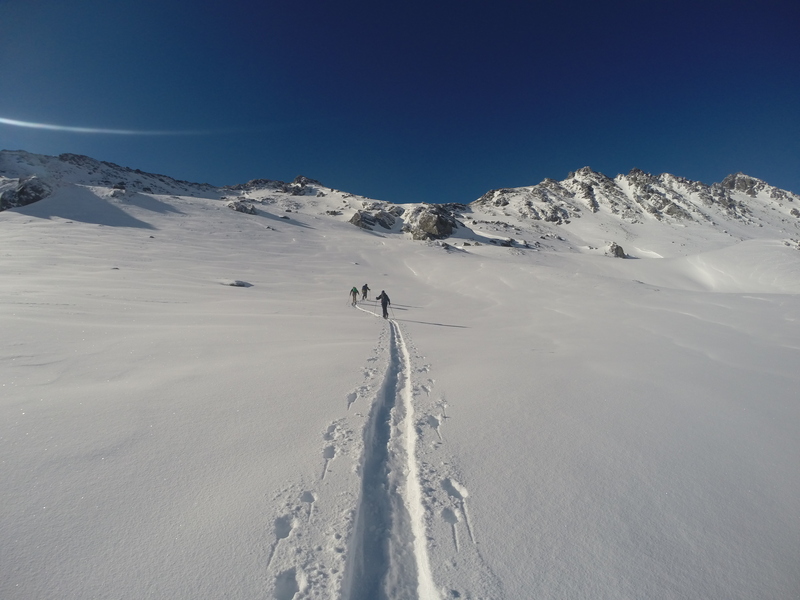 As we skinned out for the long climb back to the ski area, the winds changed North westerly and hammered us the entire way back, the collected powder of every turn i had made that day froze solid in my beard and my face stung as I broke trail. We returned to Jackel Col above the Remarkables ski area as the sun was almost gone gazing out at Coronet peak all lit up for Night skiing. Tired but stoked we headed back to the cars for some well deserved rest and beers. 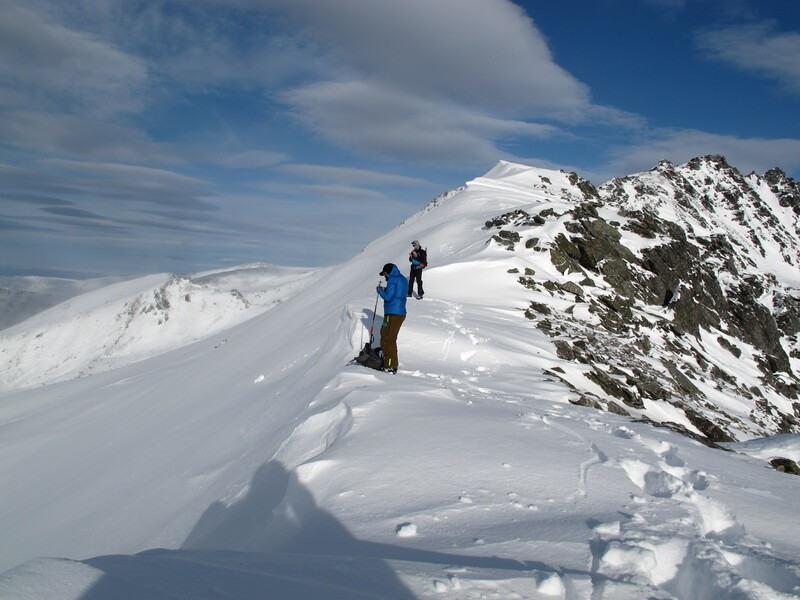 This entry was posted in Trip Reports and tagged adventure, backcountry, mountains, nature, new zealand, outdoors, powder, queenstown, Remarkables, ski touring, Snow, snowboard, Snowboarding, splitboard, splitboarding, wakatipu, Winter, Wye Creek by splitboardnz. Bookmark the permalink. RADNESS!!! Twas much better than the Two Thumbs that weekend.